A man who was trapped when the top two floors of a building in central London collapsed has been freed by fire crews. 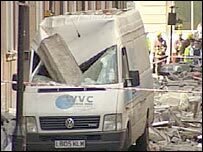 Emergency services were called to Dean Farrar Street in Westminster after the collapse at about 1600 BST on Tuesday. One injured person was taken to hospital but fire crews were at first unable to reach the trapped man. He was removed from the building, which is being renovated, at about 0130 BST. The fire service said the operation to free him was "difficult and dangerous". Crews used a crane to reach the man, believed to be a builder. A fire service spokesman said his condition was stable throughout the rescue attempt. He is now being treated at the Royal London Hospital. The five-storey building houses the office of Labour chairwoman Hazel Blears. None of her staff were hurt. Police said structural failure may have been to blame and it was down to "good fortune" it was not more serious. Metropolitan Police Commander Steve Allen said: "There's no evidence at this early stage that the damage has been caused by an explosion." Six fire engines and 50 firefighters were sent to the scene. Fibre optic cameras and listening devices were used during the rescue. A spokesman for Ms Blears, who is running for the deputy Labour leadership, said she spent several hours in her offices on the fourth and fifth floors with six other MPs at lunchtime today. Six of her campaign volunteers were in the offices, part of the Queen's Gate building, at the time of the collapse. One of them, Sean Newman, said: "Some of us who were upstairs felt the building shake. "Then we heard the alarm go off and left our stuff to go downstairs. It was a calm evacuation, but they would not let us go back in." He estimated there were about 50 businesses based in the premises. Justin Linger was also working in the building at the time of the collapse. "I was just sitting in the office when all of a sudden the whole building shook," he told BBC News 24. "As one of my colleagues put it, the building disco danced." Scotland Yard said the Health and Safety Executive (HSE) would be responsible for determining the cause of the collapse.